Are you stuck in your acting career, not sure what direction to go in next? Are you getting advice from many sources, trying to make sense of it all? Are you struggling to figure out the best way to market yourself? Not sure what classes to take, what photos to use, agents to go to? Are you sick of your monologues? Do you need help preparing for auditions and some honest feedback on your acting? Are you lacking confidence when walking into auditions? Nerves taking over that you can’t control? Well… I hear ya! I’ve heard these questions and many others over and over. Throughout my career, many actors who are dealing with all types of career roadblocks, have approached me, frustrated and confused about how to “crack the code” and be successful in this business. Whether you are just starting out or you have been in the business for many years, I am here to be your guide to your specific game plan! We are going to do this thang together! I love this quote! It speaks to every part of my life. 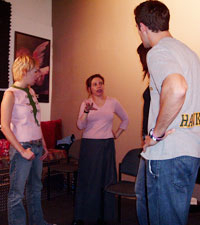 I have been casting and working as an acting teacher/coach for over 20 years, everyday learning and growing from every experience, whether it be professionally or personally. I’ve taken inspirational workshops for women, improv and storytelling classes, that have helped bring out my creativity and motivation further while facing obstacles and my own fears along the way. Being a business owner, I am always researching for unique ways to network, stand out and be competitive. And sometimes it’s doing something differently (or I like to say, out of your comfort zone) that works the best. It’s through sharing my own experiences, when I am advising actors, that helps get to those amazing “ah ha” moments. You’ll gain new perspective on your goals and more confidence overall..for auditions and how you come across professionally. This business changes everyday and the more inside scoop you gain on how to maneuver through it, the better results you will receive. I am here to reveal what’s behind that curtain! I will be there every step of the way to INSPIRE, MOTIVATE and hone in on the best way to use your specific skills, that will build your confidence and take your career to a competitive level!! It’s time to bring out clever, outside the box thinking, both for your career decisions and performance choices! Options offered for consultations are either in-person or over the phone via Skype, both at an hourly rate (see rates below). First time consultations are usually 2 hours. On-Camera Work covers work in the studio. This could be from working on monologues, to scene work, preparing for an audition, self taping, to work with commercial copy. Can’t make it out to LA for an audition? Need to go on tape for a project casting outside of New York? In Person/Phone Consultations and On-Camera Work appointments are subject to availability. Weekend hours are possible upon request. Please have access to a computer during your In Person/Phone Consultation or have a notepad and pen/pencil with you to take notes. Career Counseling Consultations: $ 125 / hour First time consultations are usually 2 hours. Any questions about rates or any of the above, please do not hesitate to ask. I’m looking forward to working with you! Pay by cash or check, no credit cards. Full payment is due at the time of the session. Cancellations at least 24 hours in advance, otherwise, you are responsible for the payment of your session. MAKE CHECK PAYABLE TO: ERICA PALGON CASTING & BEYOND, INC.